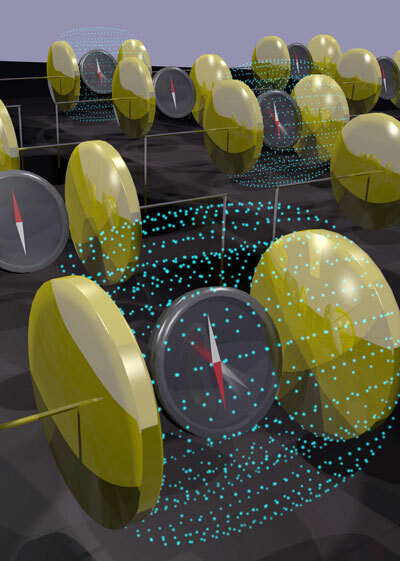 (Nanowerk News) In a development that holds promise for future magnetic memory and logic devices, researchers with the U.S. Department of Energy (DOE)'s Lawrence Berkeley National Laboratory (Berkeley Lab) and Cornell University successfully used an electric field to reverse the magnetization direction in a multiferroic spintronic device at room temperature. This demonstration, which runs counter to conventional scientific wisdom, points a new way towards spintronics and smaller, faster and cheaper ways of storing and processing data. "Our work shows that 180-degree magnetization switching in the multiferroic bismuth ferrite can be achieved at room temperature with an external electric field when the kinetics of the switching involves a two-step process," says Ramamoorthy Ramesh, Berkeley Lab's Associate Laboratory Director for Energy Technologies, who led this research. "We exploited this multi-step switching process to demonstrate energy-efficient control of a spintronic device." Ramesh, who also holds the Purnendu Chatterjee Endowed Chair in Energy Technologies at the University of California (UC) Berkeley, is the senior author of a paper describing this research in Nature. The paper is titled "Deterministic switching of ferromagnetism at room temperature using an electric field". John Heron, now with Cornell University, is the lead and corresponding author. Multiferroics are materials in which unique combinations of electric and magnetic properties can simultaneously coexist. They are viewed as potential cornerstones in future data storage and processing devices because their magnetism can be controlled by an electric field rather than an electric current, a distinct advantage as Heron explains. "The electrical currents that today's memory and logic devices rely on to generate a magnetic field are the primary source of power consumption and heating in these devices," he says. "This has triggered significant interest in multiferroics for their potential to reduce energy consumption while also adding functionality to devices." Nature, however, has imposed thermodynamic barriers and material symmetry constrains that theorists believed would prevent the reversal of magnetization in a multiferroic by an applied electric field. Earlier work by Ramesh and his group with bismuth ferrite, the only known thermodynamically stable room-temperature multiferroic, in which an electric field was used as on/off switch for magnetism, suggested that the kinetics of the switching process might be a way to overcome these barriers, something not considered in prior theoretical work. "Having made devices and done on/off switching with in-plane electric fields in the past, it was a natural extension to study what happens when an out-of-plane electric field is applied," Ramesh says. Ramesh, Heron and their co-authors set up a theoretical study in which an out-of-plane electric field - meaning it ran perpendicular to the orientation of the sample - was applied to bismuth ferrite films. They discovered a two-step switching process that relies on ferroelectric polarization and the rotation of the oxygen octahedral. "The two-step switching process is key as it allows the octahedral rotation to couple to the polarization," Heron says. "The oxygen octahedral rotation is also critical because it is the mechanism responsible for the ferromagnetism in bismuth ferrite. Rotation of the oxygen octahedral also allows us to couple bismuth ferrite to a good ferromagnet such as cobalt-iron for use in a spintronic device." To demonstrate the potential technological applicability of their technique, Ramesh, Heron and their co-authors used heterostructures of bismuth ferrite and cobalt iron to fabricate a spin-valve, a spintronic device consisting of a non-magnetic material sandwiched between two ferromagnets whose electrical resistance can be readily changed. X-ray magnetic circular dichroism photoemission electron microscopy (XMCD-PEEM) images showed a clear correlation between magnetization switching and the switching from high-to-low electrical resistance in the spin-valve. The XMCD-PEEM measurements were completed at PEEM-3, an aberration corrected photoemission electron microscope at beamline 11.0.1 of Berkeley Lab's Advanced Light Source. "We also demonstrated that using an out-of-plane electric field to control the spin-valve consumed energy at a rate of about one order of magnitude lower than switching the device using a spin-polarized current," Ramesh says.